Everything happens for a reason. I’ve always been a big believer in those words. I remember even back in high school having a stubborn debate with a good friend of mine over fate and free will where neither of us were willing to budge from our respective points of views. Personally, if this last year isn’t a validation for me that everything really does happen for a reason, then I don’t know what it would take. I just didn’t realize that I was already on this train of thought over two years ago when things just weren’t falling into place like they should have. The amount of times I’m asked why I didn’t end up going to law school like I had planned for so long or “do I still want to” is ridiculous. At first, it annoyed me. Now, it saddens me. Because it has been a dream of mine for oh so long. Or as if like a light switch, I decided one night that it wasn’t an aspiration of mine anymore. If things went my way, of course I’d like to be studying law now and be a lawyer in the near future. Life just doesn’t work that way though. Yes, I have wallowed about it many times over. Who wouldn’t over an ambition they worked towards for so long? It wasn’t until a couple of months ago though, while thinking over this past year, that it clicked for me. I was assured that yes, things really do happen for a reason. That law school didn’t work out at this given time for a reason. That He knows and plans all. This past year has been a challenge in ways more than I can explain. But it has reassured me that if I had started law school when I had planned/wanted, it wouldn’t have been possible for me to continue. And while I can’t even fathom the fact, I’m sure that it would have been even more devastating to discontinue midway. But He knew better. I just didn’t. Is it still a dream of mine? Yes. Is it meant to happen? Only time will tell. One of the most comforting food for me are chicken nuggets. And I love making mine homemade. Mix the following seasonings: salt, pepper, garlic, ginger, paprika, and cayenne pepper. I use this seasoning as a basis for pretty much everything. And I mean everything. Those seasonings you just mixed? Sprinkle some of that mixture with flour and mix well. My tip? Do this part in a Ziploc resealable bag. Not only is it an easy cleanup at the end, but the coating you get this way is just perfect. 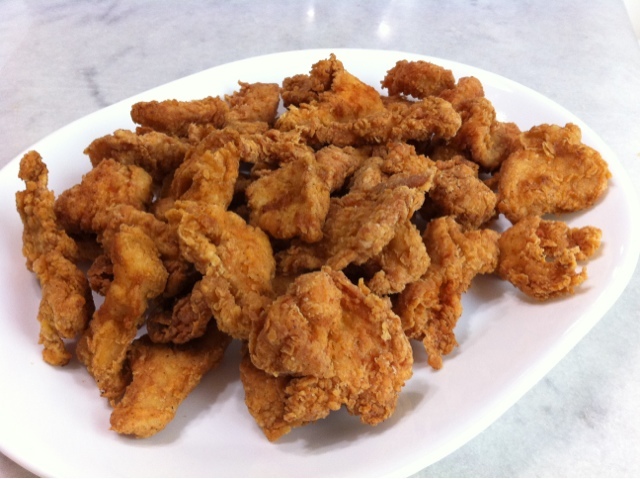 Take boneless chicken pieces (cubes or tenders… whichever you prefer) and mix the above seasoning mixture into this. Add whisked eggs. Make sure everything is combined well. Put some pieces of chicken into the Ziploc bag with the flour mixture. Seal well, and shake the bag to help coat the chicken. Do this in batches, depending on the amount of chicken you are using. Fry the chicken, and enjoy! Another tip? Make sure the oil is heated through completely before starting to fry to make sure your chicken isn’t oily, but instead crispy and moist the way you want it. We usually never get pita bread in our house. But a week or so ago, when we ordered takeout from a local Mediterranean place, they also gave us a packet of pita bread with our order for some reason. I had been trying to think of what to make with it to make use of it. Of course, the first thing that popped in my head days ago was pita pockets. But I don’t like how dry and bland they usually are. To make it more tasteful, I added a bunch of spices to the chicken marinade before grilling it and also to the sauce. Surprisingly, it turned out great! As usual, this was another quick fix! I may love cooking, but by no means do I have the patience for things that take forever to make. Easy, fast, and delicious are the criteria in my book! I marinated the chicken with salt, pepper, paprika, garlic powder, a little onion powder, chili powder, cayenne pepper and lemon juice. I grilled the chicken and then cut it across the grain. 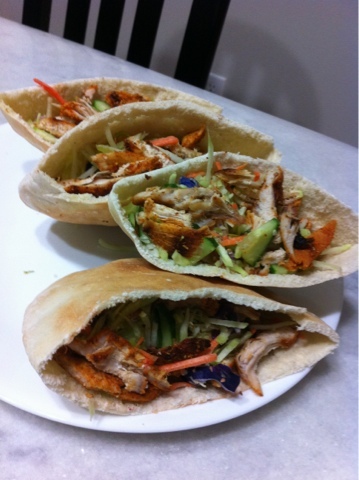 To assemble: I mixed coleslaw and cucumbers with the chicken and sauce and put it in the warm pita (which I halved). I didn’t want to fry it like I do usually. I thought about grilling it like I did last time, but I wanted it still to be juicy enough inside (without becoming tough). I wanted a breaded crust, but I didn’t want to use oil (or anything of that nature) and I also didn’t want too thick of a crust and didn’t want to use egg to coat. I decided to try using those non-stick cooking sprays, but I wasn’t sure how well that would work. 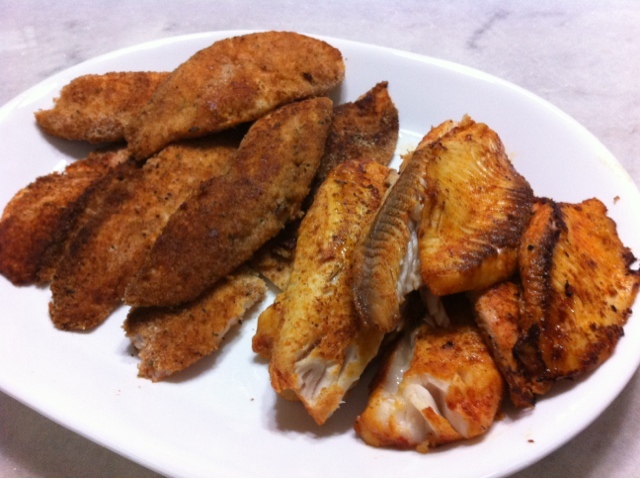 So: I tested the tilapia two different ways using the non-stick cooking spray. I cut each of the tilapia fillets in half, and marinated all of the fish with the seasonings I wanted. I used salt, pepper, paprika, garlic, cayenne pepper, and lemon juice. Besides the lemon juice, I use the combination of the aforementioned things in pretty much everything as a base. Then, I sprayed the skillet with the non-stick cooking spray (just enough to coat) on medium heat. Method one: I took the marinated tilapia, and coated it in Italian-seasoned bread crumbs before putting it in the skillet. When I put it in the skillet, I didn’t get the sizzle noise I was hoping for (the kind you would get from frying or even pan-frying). Method two: I just put the marinated tilapia directly into the warm skillet. I did one of each in the same skillet the first time to test it out — both pretty much had an even cooking time. While I ended up liking the method two version better (without the bread crumbs), my mom liked the breaded one better… which is why I ended up making both for dinner! Because I was working with eight fillets, for both methods, I cleaned the skillet in between every time I put a new set of fish in to cook. I just registered for the Central Jersey Heart Walk on Sunday, October 21, 2012 at Johnson Park in Piscataway, NJ, will you help fight the cause? Seven years ago, back on July 16, 2005, my dad had a heart attack. That day is forever engraved in my mind and was the scariest day of my life. Sure he changed his lifestyle and eating habits afterwards, but wouldn’t it be nice to have prevented it from happening in the first place? I’m walking for my dad, but more importantly I am walking with the hope that others won’t have to go through what my dad [and our family] went through! Did you know that cardiovascular disease is the number one killer of all Americans? And that heart disease kills more women than all forms of cancer combined? I would have never thought that heart disease would top [breast] cancer in women! How many of us even know the symptoms of a heart attack? Or how much they differ in women [compared to the symptoms men feel]? Click here to read a little more about the American Heart Association which is the largest voluntary health organization working to prevent, treat and defeat heart disease, stroke and other cardiovascular diseases. These diseases, the Nation’s No.1 and No.4 killers, claim more than 813,804 American lives a year. I just registered, will you help fight the cause with me by donating?